The iconic Grade I listed tower continues to mesmerise visitors whether viewed during the town’s annual Illuminations festival or from the glass floored ‘Walk of Faith’ observation deck, some 380ft up. Inspired by the Eiffel Tower and opened in May 1894, it was built over a three-year period reaching a height of over 518ft. 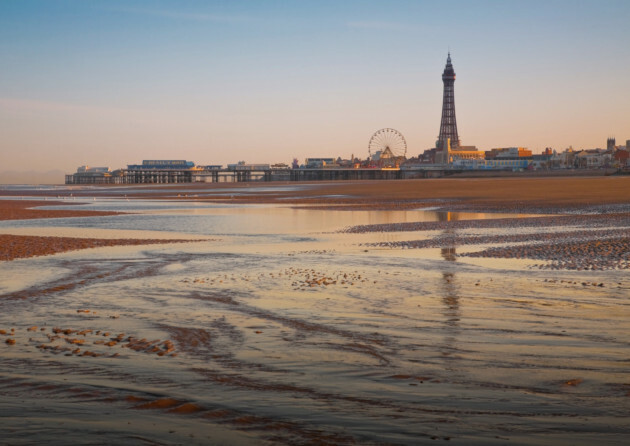 Its locally born architects James Maxwell and Charles Tuke never lived to see its completion, but their design firmly placed Blackpool on the map. The structure offered not only the thrill of the views from its dizzying heights but a wealth of attractions inside. The Ballroom was the highlight, an ornate function room where people came to dance and make merry. Following a fire in 1956 which damaged the decoration, restoration ensured the interiors were as bold as they were back in 1894. Today, older generations return to join in the daily tea dances to the sounds of the famous Wurlitzer, perhaps reliving the memories of their youth. Entertainment geared to appeal to different generations and tastes can be found on floors above and below, the latest thrilling attractions installed by Merlin Entertainments, managers of Blackpool Tower since 2010. Dare to visit the Dungeon to wander through 1,000 years of Lancashire’s murky past, narrated by a host of spooky characters; or keep it light at the Circus or Madame Tussauds. A surprising find is the 4D cinema experience, the Blackpool Tower Eye, which brilliantly sums up the tower’s history in a sensory show filled with special effects. No visit to Lancashire’s famous seaside playground would be complete without a ride on the tram which glides up and down the promenade from dawn to dusk, pausing only to refresh its complement of passengers. Launched in 1885 the fleet has carried generations of holidaymakers to and from the centre of things with seamless efficiency, and in doing so was at the forefront of British transport engineering in the Victorian age. The resort’s latest gleaming fleet, launched in 2012, has added a little extra style and comfort to the experience, replacing the much loved but time worn trolleys which now run only periodically on special heritage tours. The old double-decker ‘balloon’ trams from the 1930s enjoyed an unblemished service record, and for those who miss the sight and familiar rumbling sound of these historic vehicles, new mini heritage tours operate on bank holiday weekends between the Pleasure Beach and North Pier, just two iconic stops along the modernised sea front, which itself is a work in progress as building work continues to improve appearances. In appearance these tram are more like London tube trains with fewer carriages and better views, the sun streaming across the blue sea and through the windows. To the left the sea front attractions whizz by. At the Tower take a closer look at the nearby Comedy Carpet, another new seafront feature where some of the best wisecracks uttered by stars of stage and screen have been immortalised on the pavement. Breezy as Blackpool can often be, the tram offers shelter from the elements, showing off sites like this one at just the right pace. Having celebrated its 150th anniversary in 2013, Blackpool’s oldest pier is also the town’s oldest attraction, and though its heyday shine has faded, a stroll along its length hints at the spectacle that it must have been for its Victorian visitors. Entered through the maze of one of the town’s ubiquitous arcades, where tantalising games tempt the unsuspecting to part with loose change, the simplicity of exiting onto the pier from the gloom is a joy in itself. Designed by Eugenis Birch, also known as the father of pier design, this construction is the oldest example of his work and its design reflects his lifelong admiration of Indian architecture, which he experienced first hand during time spent working on the railways in the 1840s. Old fashioned diversions still prevail, with carousel rides and theatre performances of all types. The Victorian tea room, Conservatory and Carousel family bar each provide refreshment, or lean on the railings, ice cream in hand, and take in the views of the famous Blackpool seafront. Now standing at 1,410ft the pier was once even longer until in 1997 storms damaged the landing jetty beyond repair. This was not the first disaster to hit the structure, which has been routinely salvaged from ship collisions, storms and fire – only to rise up once more, bigger and better. For many visitors, the highlight is the Sun Lounge at the end of the pier, a place to bask in a deckchair shielded from the breeze by the partial atrium, just as the Victorians once did, soaking up the rays and the musical interludes before leisurely strolling or catching the pier tram shoreward. When William George Bean established this adventure playground in 1896, no one could foresee the longevity of its popularity. Back then, the most thrilling ride on offer was the Sir Hiram Maxim Flying Machines, which incredibly are still orbiting the same air space today. As time went on, new rides imported from America filled the 42-acre site, with the famous roller coasters introduced in the 1930s. The Grand National is one such example of heritage entertainment, a wooden coaster that rockets around the tracks in reassuringly rickety fashion. In the war years the Pleasure Beach played an important role in keeping spirits high, providing vital escapism to thousands of evacuees and service personnel without pause. Post war with the economy eventually restored, the site benefited from further development. Britain’s first monorail was built here, and faster, more thrilling rides were added including the UK’s only bobsleigh ride and a 360° rollercoaster, The Revolution. It was the 1990s that saw the biggest changes, when the exterior of the grounds was redesigned and an Edwardian-style retail complex created along the Promenade. With a £12million price tag The Big One became the world’s tallest and fastest rollercoaster in 1994. This impressive ride dominates the site, reaching a height of 235ft where sea views can be momentarily enjoyed before whipping away as the carriages reach speeds of 87mph, plunging, twisting and turning with their petrified, yet ecstatic cargo. There are now 125 rides and attractions inside the still privately owned park. The town’s world-famous annual electric show draws millions to the see the light fantastic on the seafront, taking place from 1 September to 5 November 2017. Heralded as the “greatest free light show on Earth” the mesmerising technicolour festival even includes the seafront trams that are festively transformed into steam trains, ships or vintage cars as they process up and down the street. In 1879 when the Illuminations first began with just eight arc lamps overhanging the Promenade, some 100,000 people came to witness the show, which was described as “artificial sunshine”. Scale that figure up to present day with over a million lights, the electric wiring covers more than 74 miles, with 400,000 lamps of all types ready to shine. Modern requirements have meant that the Illuminations is now a ‘green’ production, and although energy consumption has been reduced by half, the lights are no less bright. The Tower, ever the romantic focal point, becomes more like its Parisian cousin; the sea front a match for New York’s Times Square, while the giant Ferris wheel of the Central Pier turns into a beautiful circle of ‘fire’ over the water. Each year a local or international celebrity is invited to switch on the lights, and throughout the decades many famous faces have appeared, from glamorous actresses Jane Mansfield in 1959 and Gracie Fields in 1964 to Kermit the Frog and his entourage in 1979, plus stars of stage and screen ever since. 2012 was the centenary of the official Blackpool Illuminations, marking 100 years since Princess Louise officially opened a section of the specially lit Promenade. Now ready to go into its next century, the Illuminations are irrefutably Britain’s most vibrant heritage attraction.